In the aftermath of a loved one’s suicide, parents and other caregivers may feel apprehensive and ill-equipped to discuss the death with their children. Although well-intentioned, some adults may be tempted to withhold the truth of the death and explain it as an accident or another cause, other than suicide. They may mistakenly assume that a child is too young to be aware of the death or too immature to understand the implications of suicide. Some may think that discussing a loved one’s suicide may cause the child to have thoughts of suicide themselves. Yet, research has shown that children benefit from open, truthful and age-appropriate conversations about a loved one’s suicide. With truth as their foundation, children are better able to cope with the loss of a loved one to suicide and to more fully engage in their own healing journeys. Thanks to donors like you, the Illinois Chapter of AFSP is proud to offer a resource that assists with and supports these caregiver-child interactions. 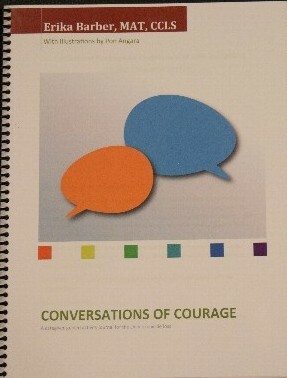 Conversations of Courage: a caregiver-guided activity journal for the child of suicide loss is specifically developed to support the unique needs of young suicide loss survivors. 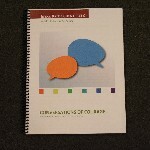 Written by a Illinois Chapter Board member and multiple suicide loss survivor, this interactive workbook encourages and facilitates shared dialogue between an adult caregiver and a child to facilitate healthy and truthful conversations, meaning-making and emotional expression following the loss of a loved one to suicide. Conversations of Courage consists of 81 pages of hands-on, topic-specific child-centered activity pages and associated caregiver narratives that offer adult guidance and suggestions for engagement within each section. Caregiver pages and activities which may not be relevant to a child’s grief experience may be removed from the guide so that the resulting journal is a personalized keepsake of each child’s unique grief and healing journey. Activities are intentionally designed to empower children to ask their questions, share their understandings and gain truthful responses from a trusting adult as they navigate the complexities of integrating a loss to suicide into their lives. Child survivors are encouraged to take an active role in managing their own mental health which will ideally transfer to lifelong skills. Further and fundamentally, Conversations of Courage promotes the preservation of relationship with their loved one post suicide through active and enduring informal and formal tribute activities. Click the Donate button and order your copy of Conversations of Courage for a donation of $20. All proceeds benefit the American Foundation for Suicide Prevention. Thank you for supporting the child survivors of suicide loss in your life and the AFSP.